I loved The Oathbreaker’s Shadow and was eagerly anticipating this sequel. 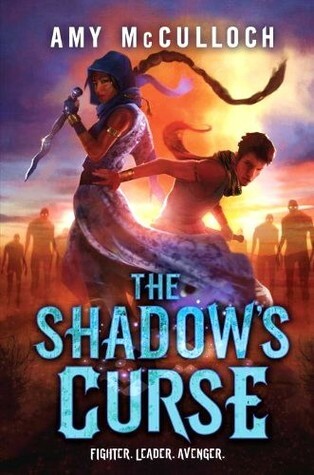 In The Shadow’s Curse, Raim sets off on a journey to learn about the vow he’d unknowingly broken and to rescue Wadi, the girl he loves, from his former best friend turned tyrannical khan Khareh. He develops his own powers as a sage and learns that he may be destined for a future greater than he’d ever dreamed. There are a lot of things I like about this story, but overall, it wasn’t as compelling as the first book. Having built such a rich mythology in Oathbreaker’s Shadow, McCulloch’s sequel simply gets to work taking the characters closer to their respective destinies. We learn more about Raim’s vow, see his powers develop in an interesting way, and catch a fascinating glimpse into society in the South (a much different culture from Raim and Khareh’s, though perhaps more familiar to readers), but, particularly in the first half, the narrative feels workmanlike rather than magical. Part of it may be that I hadn’t read Oathbreaker’s Shadow in a while, and so took a while to re-establish a connection with the characters. Early in the book, a prisoner is rescued and it took me a while to figure out who he was or why he was important. The story, and Raim’s motivation, also seemed to focus more on the love between Raim and Wadi rather than the larger scale political situation or promise knot mythology — even Raim’s quest to rid himself of his oathbreaker mark is fuelled by his desire to become strong enough to rescue Wadi. The love story was never too gushy, but the shift to this standard trope still seemed a waste of the vast potential set up in the first book. As well, Wadi never seemed to be in danger from Khareh in the first place. She openly challenged him and attempted escape multiple times, and yet, despite his reputation as a tyrant, he never harms her and in fact often does things to protect her. She is treated better than other prisoners because she can read and write, a valuable skill for Khareh since most of his team cannot. Yet we rarely see her using this skill to help Khareh, making her preferential treatment baffling. Khareh also explains his behaviour by saying that his oathbreaker’s shadow — a piece of Raim haunting him — is drawn to her. This doesn’t completely make sense, and worse, negates any sense of urgency for Wadi’s rescue. The story hits its stride around the halfway point, and again, I am swept up in the storytelling. Once the story shifts away from Raim’s desire to rescue Wadi and back towards his need to remove his oathbreaker’s scar and fulfill his destiny, McCulloch returns to the more epic scale narrative that made the first book so strong in the first place. Still, it never quite lives up to the promise of Oathbreaker’s Shadow, which admittedly set a very high standard to follow. So much more could have been made of Raim’s training to become a true sage, with powers unencumbered by reliance on a shadow. What other powers could he have developed? How did he learn to do some of the things he did? There are descriptions of some pretty impressive feats, but the journey towards those feats seemed underdeveloped. Khareh as well seemed woefully underdeveloped as a character. We see multiple facets of his personality through Wadi’s observations, but he is such a complex figure that I would have loved to hear him tell his own story. How can we reconcile the image of a man who would order another to be trampled by elephants (the scene made chilling by a party atmosphere and almost throwaway reminder of the victim) with the same man desperately desiring to be reunited with his former best friend? Wadi is never sure if Khareh can be trusted, particularly in intentions towards Raim, and so neither are we, yet I would love to see that struggle from the perspective of the man himself. The ending was satisfying, but also felt somewhat anticlimactic. The big battle scene was impressive, but the resolution felt too neat. A character makes a surprising decision near the end that felt absolutely right, and would have ended the story on a strong note. Yet pages later, another character also makes a decision that does make sense, but it also feels like a Twilight-type satisfying ending for all. There were so many reveals and reversals in the last few chapters and because it was the first couple that held more emotional resonance, the final one just felt extraneous. Shadow’s Curse is a good book. I enjoyed reading it and from the halfway point onwards, couldn’t put it down. I like the characters and I love the world that McCulloch created. Oathbreaker’s Shadow is still one of my favourite YA books, and to be fair, nothing short of epic would have met my expectations in a sequel. This sequel is good, and an exciting read. It just wasn’t epic. This entry was posted in Book Reviews and tagged 50BookPledge2014, Random House, YA by Jaclyn. Bookmark the permalink.